We've all been hearing a lot of talk about online, blended learning, and I've been scouring the internet finding definitions for it and seeing how it's being implemented in different schools. This week, I had an opportunity to attend a two-hour conference blended learning, and doing so confirmed some of the thoughts I've been having about it. A blended learning approach combines face to face classroom methods with computer-mediated activities to form an integrated instructional approach. The goal of a blended approach is to join the best aspects of both face to face and online instruction. Classroom time can be used to engage students in advanced interactive experiences. The blended learning models discussed on the Education Elements site are being implemented in a formal and well conceived manner, but if you're a teacher using digital media in any way, you're probably also experimenting with and/or implementing blended learning in your classroom, in ways that particularly enrich your curriculum. The Greco-Roman World Lives On and On and On . . . Some of the educators I've spoken to who are interested in blended learning are intrigued by it partly because the formal model of it has been touted as economically friendly. Before investing in the expense of "going blended," I'd like to offer my humble opinion. 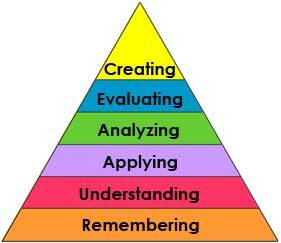 Then you're going to be told that blended learning allows a teacher to develop higher order thinking rather than focus on remembering and understanding. The plan with blended learning is that once students complete their online learning, some form of software with course content that gives teachers data about student performance, they will then be ready for small-group instruction. During small-group instruction, the teacher can spend time asking students to apply and analyze what they've learned, and then students can work in groups to evaluate their new knowledge and create original content with it. I love that last part. I definitely want to see more project-based learning in schools. As an English teacher, I'm intrigued by the notion that I can use software that will force students to italicize the name of a play or novel or capitalize only proper nouns, before they can advance to the next grammatical exercise. I'm so sick of teaching the same grammar lesson over and over, only to have students completely ignore a rule they learned on the next assignment they hand in. Teaching grammar is a Groundhog Day nightmare for me. I'm also interested in having data about students' knowledge of grammar and of their ability to create sound arguments that they must back up with sufficient evidence. This data is attainable through the ELA software programs developed for online, blended learning, and having the computer do some of the dirty work of the English Language Arts classroom sounds delightful. My problem lies in the way the blended learning model is being developed. When I asked at the conference I attended what kind of interdisciplinary lessons are being implemented in the blended learning models being touted, the reply was none. Therefore, while the blended learning model is offering a lot of new data that teachers can get excited about, time for whole-body learning, and perhaps a price point that is appealing as well, educationally it may not be offering the whole-person learning experience that I think should be at the center of education today. “Kids are very spiritual — they want a bigger purpose. . . . "
We must engage the whole child, and we cannot do so if we continue to set up courses as discrete units that don't have relevance to and interact with each other. My job as Coordinator of Interdisciplinary Studies is to create those connections among the students' classes, so that students not only see that one class is necessary for an understanding of another, but that all their classes connect to who they are as human beings and will help them understand what their higher purpose in the world is. If we remain on an educational course that doesn't plan for those larger aims from the onset of the curriculum planning process, then students may or may not be lucky enough to have a Mr. Wright in their lives, and their formation as whole people will be a rockier process or may never happen satisfactorily at all. In a religious school such as Frisch, where I teach, the creation of meaning and religious purposefulness is crucial in curriculum development, but Mr. Wright shows that all people yearn for meaning in their lives. We all want to feel that what we do has a higher purpose, and students deserve a way to be shown that the interests and passions they have can be used to make a positive difference on this planet. Let's be honest, when we read any article about good teachers, you know, the ones all students love and people make after-school specials about, we know that those are the ones who are thinking about students as whole people and not just as containers to hold math, history or science knowledge. So anyone in education today has to make sure that we create a system where students are engaged in whole-body and whole-person learning, what my son Solomon, a junior at Frisch, calls, respectively, "physical" and "spiritual" learning. Therefore, my conclusion about blended learning for now is that it is a tool. It's an interesting tool with a lot of potential, but the potential must be harnessed correctly by thoughtful educators. "Learning without love isn’t learning; it's production." Let's make sure our students love what they learn, learn what they love, and learn to love while they learn.